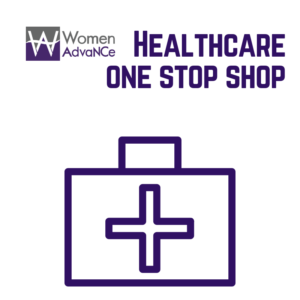 Editor’s Note: Women AdvaNCe is proud to support and be a part of this event on April 14th. 2018 is shaping up to the be the Year of the Woman. From the halls of government to stages and theaters from coast to coast, from marches and protest to industry strikes and the leadership of young students: Woman are raising their voices and telling all of us about the world as they see it and the world they want to us become. 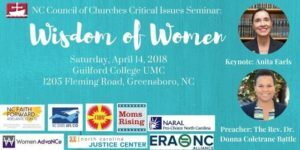 It’s no surprise the North Carolina Council of Churches has chosen Wisdom of Women as the focus for their bi-annual Critical Issues Seminar. Partnering with a host of organizations to bring an array of quality workshops to participants, the event will be highlighted by an amazing teacher and brilliant keynote speaker, Justice Advocate Anita Earles, and a wise and passionate preacher, the Reverend Dr. Donna Coltrane Battle. Long before the Women’s March Movement brought women’s voices to the fore on matters of justice, women have always worked to make the world a better place. Historically, much of their work was subversive because rules and social norms prohibited their public engagement. 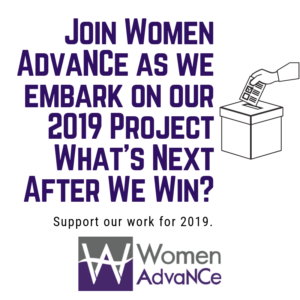 Those days are long gone and the work that women have always done is manifesting itself in the public square, legislative assemblies, and corporate boardrooms. All this while still working behind the scenes in homes, schools, and churches to make the world a better place. Workshops throughout the day will both demonstrate the good work being done by women and on behalf of women, while also illuminating some of the places where more work is needed. Most of us know the statistics about wages, poverty, harassment, etc. ; this event will help expose some of the causes so all of us–women and men–can work diligently to make the world a better place for all of us. Joining Earles in the spotlight as the Preacher for the day is Donna Battle, Chaplain at Meredith College and native of Yanceyville, NC. Battle is quickly gaining a reputation as a preacher who can bring The Word, mining the prophetic voice of the Old Testament and the Gospel imperatives of the New Testament to summon our better angels for work in these polarizing times. Prior to coming to Meredith she served several local churches, was the executive pastor of The Way Christian Center in Berkeley, CA, and was associate dean of the chapel at Shaw University. Battle earned her seminary degree from Duke Divinity School and she holds a Ph.D. in Marriage and Family therapy from Eastern University. The event will be at Guilford College UMC, 1205 Fleming Rd, Greensboro, NC 27410 on April 14, from 9am to 3pm. You may register online at: ncchurches.org/event-single/wisdomofwomen or call the Council offices at 919-828-6501.